Back in those days 30 points was insurmountable, whereas nowadays you can cruise past it. 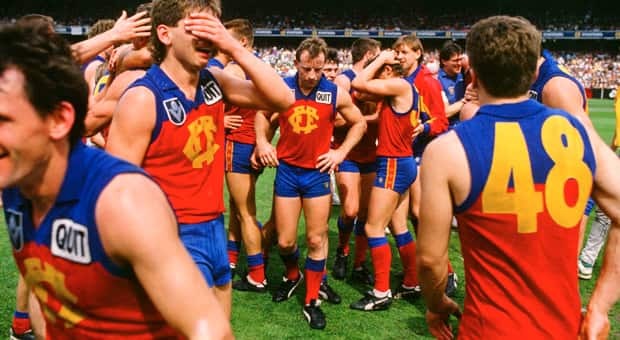 While the Brisbane Lions continue to celebrate the 10-year anniversary of their historic hat-trick of AFL premierships, the Club’s Historical Society in Melbourne recently wound the clock back even further (24 years to be exact) to reunite the players, coaches and officials who were part of Fitzroy’s 1989 reserves premiership. It remains the last premiership of any type that Fitzroy won prior to the 1996 merger, and is remembered fondly by the old ‘Roys faithful. The match was played at the MCG as the curtain-raiser to the VFL senior Grand Final between Hawthorn and Geelong, which many still consider to be the best ever. But for Lions fans, it was their own team’s stunning come-from-behind win in the earlier match – coincidentally against the Cats’ reserves – that will forever be associated with that particular day. Fitzroy made their way through to the reserves Grand Final against all odds by defeating the more high-fancied Essendon and Carlton reserves sides. Their dream run looked to have come to an end midway through the third quarter, with Geelong holding a comfortable seven-goal lead, before a brutal melee erupted. The incident ultimately helped kick-start the Lions who went on to record a remarkable two-point victory. The match would also serve as the last hurrah for some of the Club’s all-time greats – including Michael Conlan, Leon Harris and Ross Thornton – who decided to hang up the boots at the end of the 1989 season. Around 150 Historical Society members and guests joined Conlan, Thornton, Harris, Mark Scott, Chris Waterson, Graham Osborne and many others at Etihad Stadium last Thursday night to take a trip down memory lane. “Two words – Robert Bolzon. Geelong had two very good players. Darren Morgan, who had kicked five goals in the first half, and he failed to see out the game. And they also had a very good first rover called Gary Cameron, and he failed to salute the judges at the end of game too. One was courtesy of Robbie Bolzon, and the other courtesy of Darren Wheildon. So Geelong were forced to play two short, and we caught them. But seriously, I remember Graham Osborne did some inspirational stuff in the centre of the ground, including a long, long goal just before three quarter time which brought us back to within 30 points. “The game was played on a very special day, because it was when Gary Ablett kicked nine goals against Hawthorn, which still goes down as one of the great Grand Finals. “I think we played four finals in a row at Waverley, from memory. It was a lot of hard work to get there. Of course, when you’re 19 you’re used to going to the MCG to watch a Grand Final – you don’t ever expect to go there and play in one. It was a great experience. “Certainly not. At that stage of my career, being 31 years of age, I was well beyond that. When it did start to happen, I admit that I started to feel sorry for the guys getting hit. Our players did become quite aggressive, and it certainly changed the game. “I think we played Bulldogs in Round 22, and really had to win it to get in (the Finals). For the first final, we had about six senior guys come into the side, and I don’t know about the rest of the guys, but there was a bit of a feeling that it could have been our last game. Then we beat Essendon in a pretty rough sort of game that we weren’t supposed to win. They had some really good players, so it was a really tough game. Don’t miss the Historical Society’s annual dinner on Wednesday 31 July at the Veneto Club in Bulleen, when they honour Fitzroy great Bill Stephen. You can become a member of the Historical Society for just $20, which goes towards helping preserve the wonderful Museum located at Etihad Stadium.